This product is ideal for people wishing to shower in better water for their skin and hair to remove the dryness and irritation caused by chlorine and other chemicals in mains tap water. Supplied with two elbow shaped adaptors, this fantastic shower filter unit can easily attach to virtually any bath or shower in seconds enabling you to keep your existing shower head and have the filtration occur in-line. There is a replaceable filter component inside the shower filter casing which can be easily removed and replaced in seconds. You can add replacement filters to your order by selecting the options above. The filter lasts for approximately 5 months in a two person home. The shower filter has consistently shown to help alleviate bad reactions to chlorine making it ideal for people with sensitive skin, including people with eczema, psoriasis and dry skin conditions. For people without these conditions, the shower filter leaves you with a moisturised feeling after showering by protecting your skin and hair from the oxidant elements in tap water, preserving the skins natural proteins. A unique feature of shower filter is the removable cartridge system, enabling you to easy change the internal filter. 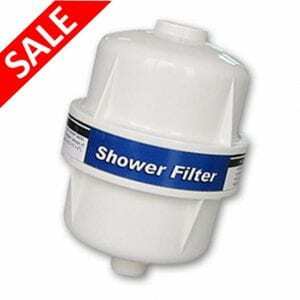 This shower filter provides an effective media to remove chlorine in high temperature shower water for chlorine free showers. Fitting is ever-so simple and almost as easy as screwing on a light bulb! Can be easily fitted on any existing hose connection in seconds. 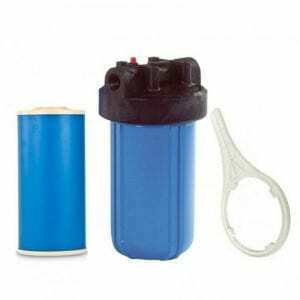 The internal replaceable filter cartridge will last for approximately 5 months in a two person home. This is based on compliant water quality within the UK. The shower filter uses natural coconut shell carbon and the patented KDF copper-zinc alloy, which both provide the most effective media there is to remove chlorine in high temperature shower water. KDF's performance actually improves the higher the water temperature. With this technology, our filter has been shown to effectively remove 97+% of this damaging chlorine, for up to 1 full year (for 2 people) - 2 to 3 times longer than other shower filters. KDF can also remove iron and other heavy metals, sulphur, and it controls the mould and mildew in your shower. This KDF Shower Filter installs in minutes, with no tools on any shower arm with standard 1/2" pipe threads. Simply unscrew your shower head from the shower arm, attach your shower head to the end of the filter, and install the filter on the shower arm. It's as easy as screwing on a light bulb! Chlorine can have a strong odour (swimming pool smell) and can cause irritation to skin and to the scalp, especially to those people with skin conditions like psoriasis and eczema. The body of the Shower Filter is guaranteed not to rust or corrode. The time between changes is dependent on the amount of water used and the amount of chlorine or other ingredients in the water. As a rough guide, the Shower Filter will need changing every 6-12 months. We will also send you reminders of when they are due every 6 months. 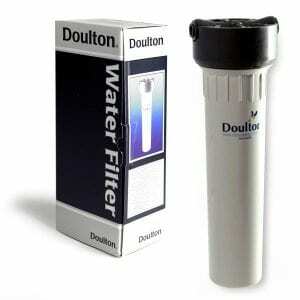 It combines the quality Doulton undersink filter with an extra filter alongside to remove fluoride from your tap water. This filter really gives you peace of mind by removing contaminates such as chlorine, e.coli, chemicals as well as fluoride. You will instantly taste the difference and unlike some filter systems it won't remove good minerals found in tap water. Our water supply has been supplemented with fluoride for years, despite the fact that controversy still rages about its safety. Countless studies point to evidence that it is not only unnecessary, but can also be dangerous to your health. Fortunately, there is a simple solution. A Cleanwater fluoride water filter will eliminate fluoride and other toxins from your drinking water, providing you with a safe and healthy supply of drinking water at an affordable cost. A Cleanwater fluoride water filter will help to prevent the onset of dental fluorosis, a condition that results in brown, pitted teeth. Dental fluorosis occurs as a direct result of ingesting fluoride through drinking water and other sources. Other studies point to the fact that fluoride in water is both a carcinogen and mutagen. Cleanwater's latest compact, portable and countertop reverse osmosis water filter, the world's first revolutionary, installation-free household Reverse Osmosis (RO) counter top water purifier which also serves to provide, ambient, hot and boiling hot water at your fingertips with great ease of use and easy maintenance. A filter kettle like other portable purification system. The most efficient RO system on the planet! 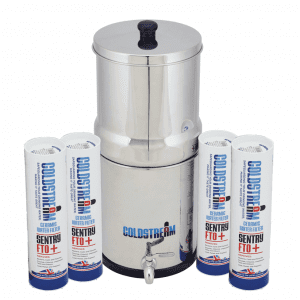 Portable water filter, counter top water dispenser, best kettle ever! ✓ The only pure water kettle on the market and 80% more energy efficient than a reguilar kettle! ✓ Simply plug and play! No need for any installation! So easy! 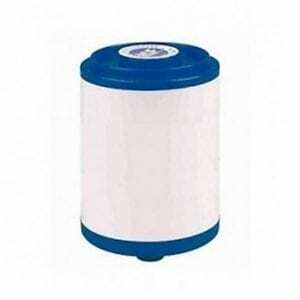 ✓ Thousands of times more pure than traditional gravity filters or jug filters. The most efficient RO in the world, only 1 litre of waste for every 5 litres of water! ✓ Replaces your kettle by also producing reverse osmosis quality water, ambient, warm, hot or boiling at your fingertips! ✓ Uses a ceramic heating element instead of metallic so water can be made pure (low TDS) without heavy metal extraction! ✓ Uses flow monitoring to detect filter life and alarm, plus fail safe built in to never dispense bad water. It's just so good! There is nothing else like this on the market. It solves the cost and time of installation and you can take it anywhere and have it in any room. Its really easy to fill up the water, you just take out the tank, fill it and pop it back in. The unit is completely stand alone with no connection to the drain. It makes the perfect choice anyone who wants the convenience of a top of range purification system with no installation and also for single people, students or small families, people who regularly travel and who are currently renting their property and cannot have a system installed on tap. The unit is incredibly easy to use and assemble. Simply take it out the box, plug it in and fill the supply pitcher. Place it back into system and turn the dial to adjust the temperature and press to dispense and stop, that's it! Within minutes you will have reverse osmosis quality water, ambient, warm, hot or boiling at your fingertips! This Active Ceramics House Fluoride Water Filter System is the best whole house filtration system available as it is specifically designed to remove several ingredients, particularly Fluoride. The system uses a unique filtration method is used to produce clean good tasting water for the whole house (and even the garden - for plants, paddling pools, etc). Removes 100’s of ingredients down to 1 micron including Chlorine, Fluoride, bacteria, THM’s, Heavy metals including Lead, Arsenic, Barium, Cadmium, Chromium, Selenium, Mercury, Iron and others. Very few filters are so effective in reduction of hormones and Fluoride. One of the most effective filtration systems at killing bacteria, and ensuring a bacteriostatic environment within the filter (NO bacteria, algae or fungi can grow within the filter). See list below for list of ingredients removed.Active Ceramics Large Whole House Water Filter System is the best whole house filtration system available as it is specifically designed to reduce the levels of several substances, particularly chlorine, toxins, heavy metals, hormones and fluoride. The filter is highly advanced and effective at killing and containing bacteria in water such as E-coli, Pseudomonas etc. 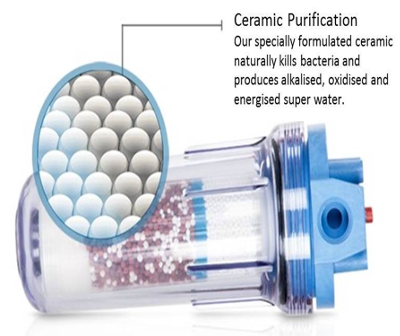 The system uses a unique filtration method using a patented active ceramics blend, so it has 4 different active ceramics which treat the water in a different way and is completely unique.Unlike other whole house water filter, the Whole House Fluoride Water Filter System adds antioxidants and minerals back into the water after filtering and additionally makes water more alkaline by raising the pH value, usually increasing the pH to around 0.5 a point (however this could be more or less depending on a number of specific variables).The system can is used to produce clean and great tasting water for the whole house (and even the garden - for plants, paddling pools, etc). Very few filters are so effective in reduction of Hormones and Fluoride. One of the most effective filtration systems at killing bacteria, and ensuring a bacteriostatic environment within the filter (NO bacteria, algae or fungi can grow within the filter). See list below for list of ingredients removed.The Eco-AdvantageAt the end of the life of the cartridge you can take out the ceramics and use it to fertilise your garden to improve the health of plants or grass and soil drainage. The plastic housing can be put through your normal recycling waste. It is recommended to use this system in conjunction with a 2.5" x 10" Sediment Filter System as a post filter (for mains tap water). 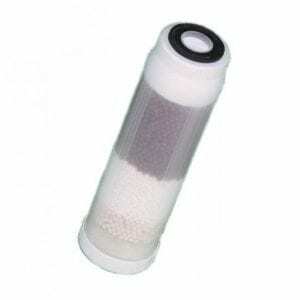 If you are planning to use this on a private water supply, it is recommend you use two sediment filter systems as pre and post filtration for optimal performance. Sediment filters are usually changed every 9-12 months or when/if you find small sediments in your glass of water. The reason for this is because the system has a crystallizing effect on the scale to stop the scale sticking onto surfaces. Therefore, after a certain period of usage you may notice small sediments of scale in your glass of water. The post sediment filter system will ensure these get removed. 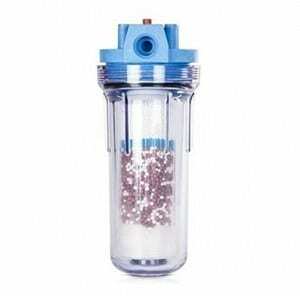 The pre-filter is recommended for private water supplies to protect the main filter. Small and compact whole house filter for medium/large home with pipework up to 1” diameter. Drink filtered water from any tap throughout the house. No need for filter jugs or separate drinking faucet. Unit will remove chlorine, toxins, heavy metals, hormones and fluoride. Effective at killing and containing bacteria in water such as E-coli, Pseudomonas etc. 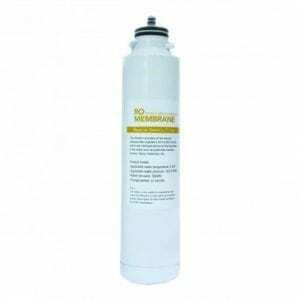 Provides softer, non-scaling water for kitchen and bathrooms. De-chlorinated water which is less aggressive on skin and hair in the shower - perfect for eczema and psoriasis sufferers. Produces pH enhanced water with minerals and increased alkalinity. Increases anti-oxidants in the water too. No ongoing maintenance or need to backwash system. Merely replace cartridge at end of life at low cost. Post filter recommended for polished water and removal of sediment including dust, rust and other particulates. Environmentally friendly due to longlife nature and less going to landfill. No more bottled water. Naturally degradable ceramics which can be scattered on lawn and plants at end of life for improved soil drainage and plant growth. 3 year life or 300,000 litre capacity. Life of filter may vary depending on water hardness and local water quality. Includes bracket and spanner. Dimensions: 340mm x 180mm x 180mm Flow rate: 40 litres per minute. Big Blue housing and cartridge - WRAS approved. The material of the spheres is approved by the Water Research Centre under the Water Bylaws scheme for use in contact with potable water. NSF approval has also been granted. The active ceramic media has been tested by South West Water Laboratories for microbiological removal and certified for bacterial removal Port size: 1 inch inlet/outlet. Add the 15mm Conversion Kit to use the system with 15mm copper pipe. 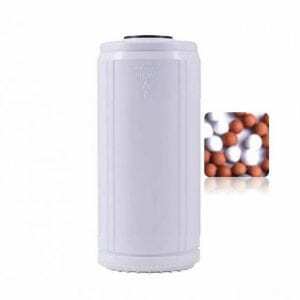 Ceramics Small Whole House Filter System is a high performance, long-life, compact whole house water filter system, ideal for when space is limited. The advanced filtration system will remove chlorine, toxins, heavy metals, hormones and fluoride and is highly effective at killing and containing bacteria in water such as E-coli, Pseudomonas etc.Whole House Filter System is a high performance, long-life, compact whole house water filter system, ideal for when space is limited.The advanced filtration system will remove chlorine, toxins, heavy metals, hormones and fluoride and is highly effective at killing and containing bacteria in water such as E-coli, Pseudomonas etc. Ceramic Media is NSF Certified.Through the active ceramics, the Osmio Active Ceramics Small Whole House Filter provides softer, non-scaling water for kitchen and bathrooms and de-chlorinated water which is less aggressive on skin and hair in the shower - perfect for eczema and psoriasis sufferers.The filter produces pH enhanced water with minerals and increased alkalinity and anti-oxidants in the water too.The system is very easily to maintain and filter life is up to 2 years or more (or 100,000 litres).The naturally degradable ceramics can be scattered on lawn and plants at end of life for improved soil drainage and plant growth. Small and compact whole house filter for 2 - 3 bedroom home. Can be used as longlife drinking system - circa 5 years. Life of filter may vary depending on water hardness and local water quality. 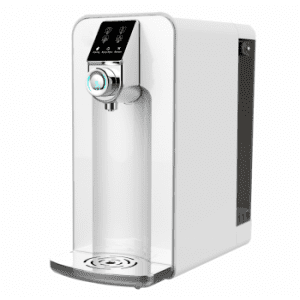 Drink filtered water from any tap throughout the house. No need for filter jugs or separate drinking faucet. Unit will remove chlorine, toxins, heavy metals, hormones and fluoride. Effective at killing and containing bacteria in water such as E-coli, Pseudomonas etc. 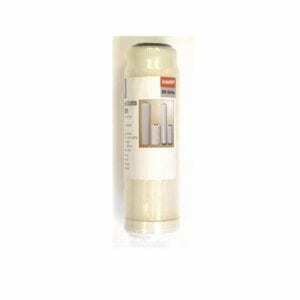 Provides softer, non-scaling water for kitchen and bathrooms. De-chlorinated water which is less aggressive on skin and hair in the shower - perfect for eczema and psoriasis sufferers. Produces pH enhanced water with minerals and increased alkalinity. Increases anti-oxidants in the water too. No ongoing maintenance or need to backwash system. Merely replace cartridge at end of life at low cost. Post filter recommended for polished water and removal of sediment including dust, rust and other particulates. Environmentally friendly due to longlife nature and less going to landfill. No more bottled water. Naturally degradable ceramics which can be scattered on lawn and plants at end of life for improved soil drainage and plant growth. 2 year life or 100,000 litre capacity Flow rate - maximum of 25 litres per minute. Dimensions (L x W x H): 320mm x 130mm x 130mm Ceramic Media is NSF Certified. Port size: 1/2" - option to add 15mm push fittings for 15mm speedfit or cooper pipe The system comes with a L-shape securing bracket so the system can be wall mounted. It also comes with the spanner to open and close the filter housing.